Italian authorities have evacuated 630 people from their homes near the collapsed bridge in the northern city of Genoa. According to the Associated Press, they are worried that more sections of the Morandi Bridge could prove unstable. At least 39 people have died so far, officials said, and rescuers continue to search for missing people. 630 people who live near what’s left of the highway bridge which collapsed in Genoa, northern Italy, have been evacuated from their homes in case more sections fall apart. Authorities in the city asked people to leave their homes as a precaution a few hours after the bridge fell down on Tuesday morning, killing at least 39 people. According to the Associated Press, by Thursday afternoon 630 had been moved on. It is still not clear why the bridge collapsed, but the evacuation suggests that there is a chance that whatever caused the initial collapse bring down more of the structure. The bridge was part of the A10 highway, and most of its length crossed railway tracks and a small river. But there are buildings, including homes, under some parts of it, specifically the areas closest to the sides of the valley it crosses. Some people live very close to the structure, like this man interviewed by Annie Hill, a correspondent with Sky News. Fire authorities went inside some of the abandoned apartments to rescue documents and, in one home, a pet cat, AP reported. A man who works nearby described the collapse in an interview with the Reuters news agency. “To see a pylon come down like papier-mache is an incredible thing,” he said. Italian Prime Minister Giuseppe Conte declared a 12-month state of emergency in the Liguria region as a result of the collapse. 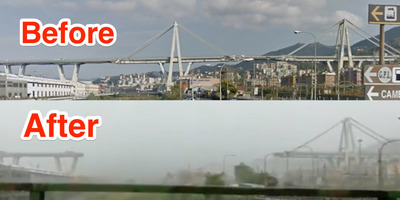 Twitter/Google Maps/Business InsiderA before and after image of the bridge, BI.